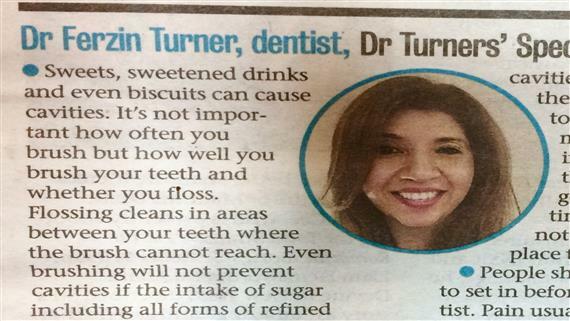 Home » Posts Tagged "Dentist news"
Sweets, sweetened drinks and even biscuits can cause cavities. It’s not important how often you brush but how well you brush your teeth and whether you floss.Flossing cleans in areas between your teeth where the brush cannot reach. Even brushing will not prevent cavities if the intake of sugar including all forms of refined carbohydrates (white bread too) is not decreased. Missing or extracted teeth should be replaced as soon as possible as the remaining teeth drift into this space resulting in food lodgement between the teeth, which leads to cavities and gum problems in the adjacent teeth. It’s vital to act early as replace ment of these teeth with implants, which is today the treatment of choice, gets more difficult as time goes by and there is not enough bone left to place the implants on. People should not wait for pain to set in before they see their dentist. Pain usually means the cavity has reached the centre of the tooth, which contains contains the blood vessels and nerves (pulp). At this stage, only a rootcanal can save the tooth. So, visit your dentist every six months to diagnose problems and treat these in the early stages.